So... I'm going to be selling some things in my work's Christmas craft sale at the end of November... but I need a name for my "company". I'll be selling things like chocolate dipped pretzels, maybe some gingerbread cookies and maybe some other stuff in the same general theme if I feel like it and don't eat it all before I try and sell it. ok i totally ripped that off south parks chocolate salty balls. 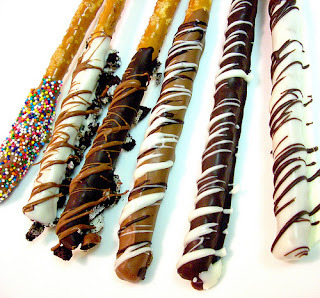 I love chocolate covered pretzels. Id love to dive into a giant vat and eat until i puked.